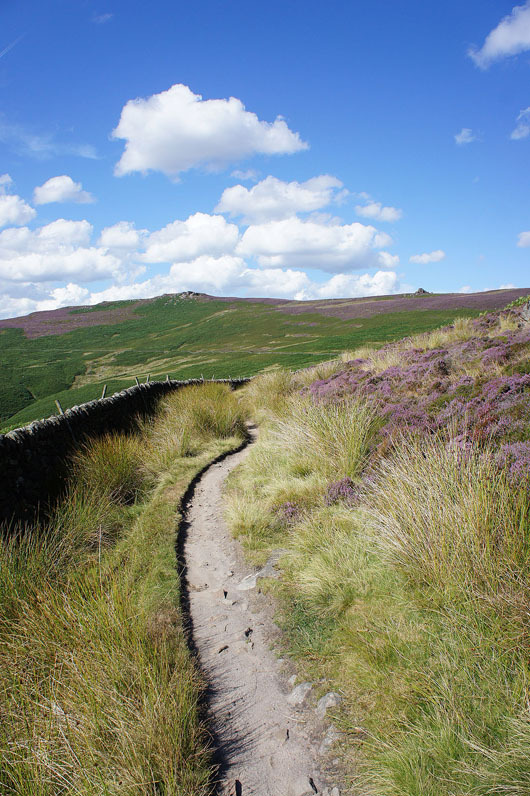 One of my favourite walks in the Dark Peak and good weather to enjoy it. 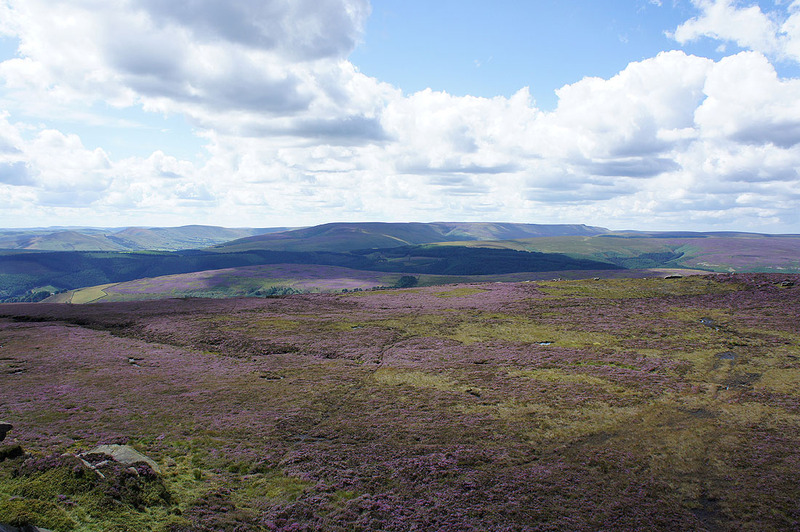 More sunshine developed as the afternoon went on which made the displays of blooming heather even better to look at. 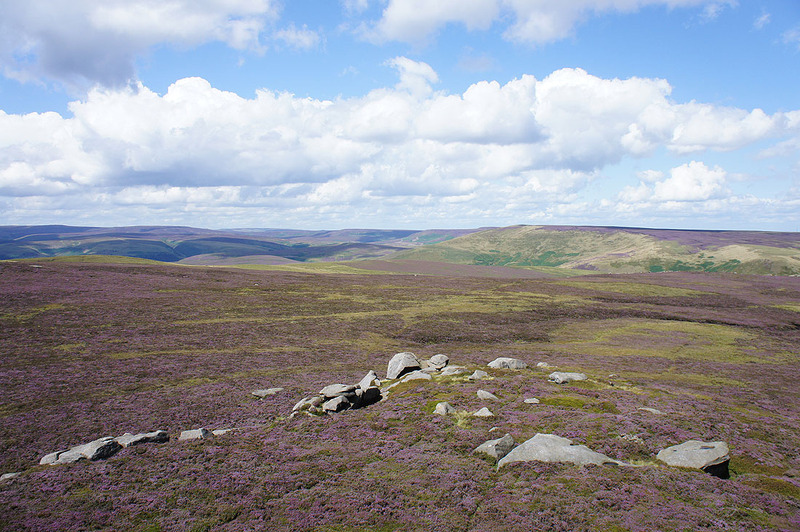 Quite windy on the tops though, which I was glad of, as it kept all the insects away that would have been attracted to the heather. 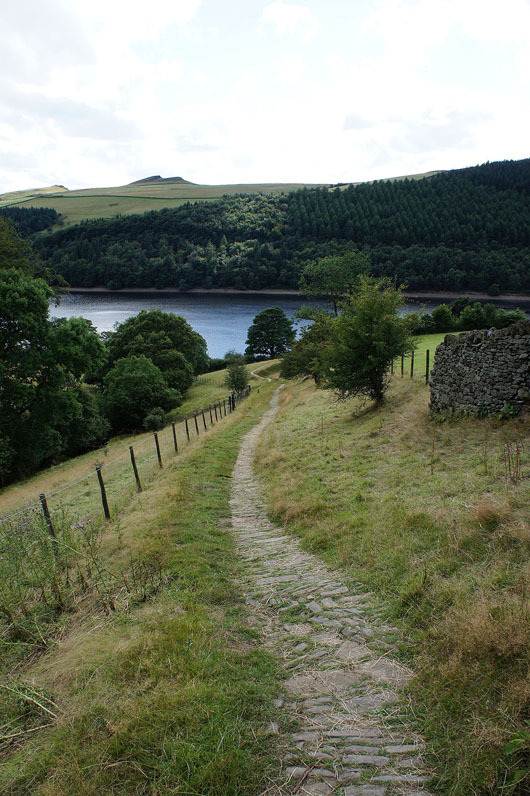 From the car park at Fairholmes I took the path that heads under the Derwent dam and onto the track that follows the eastern shore of Derwent Reservoir. 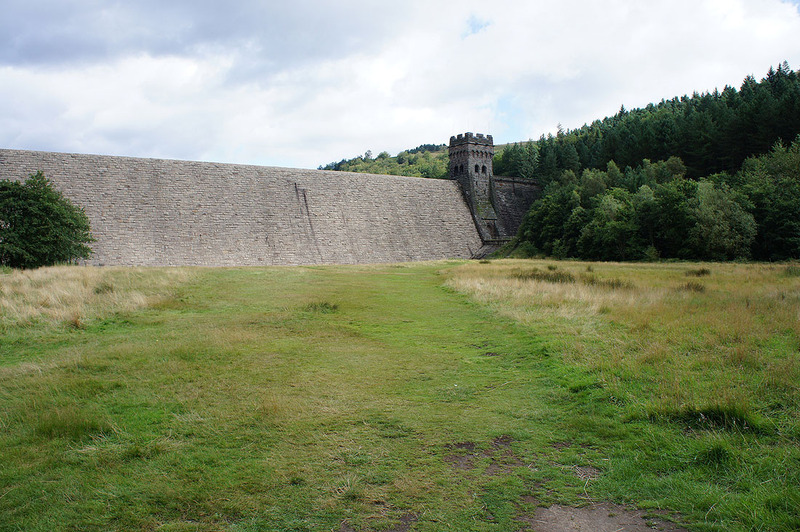 When the Howden dam came into view I turned right onto the track that follows the south side of Abbey Clough. 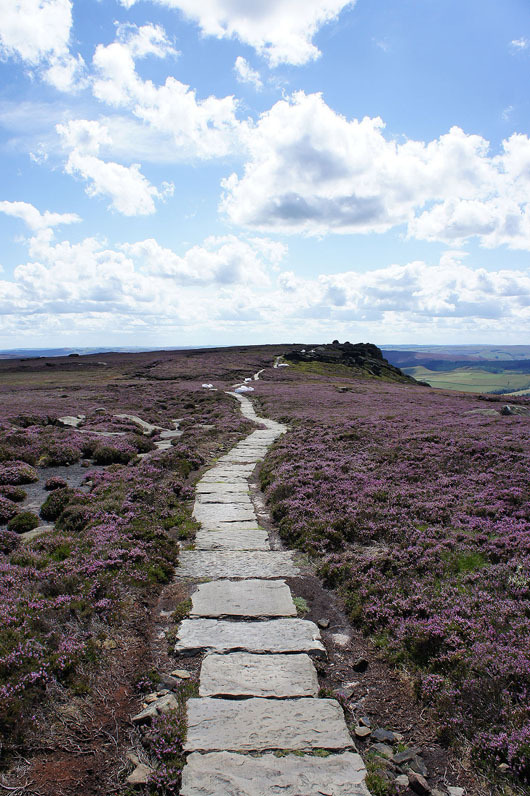 I then followed the path all the way up the valley to its end on the Cartledge Stones Ridge where a flagged path carried me south to Back Tor. 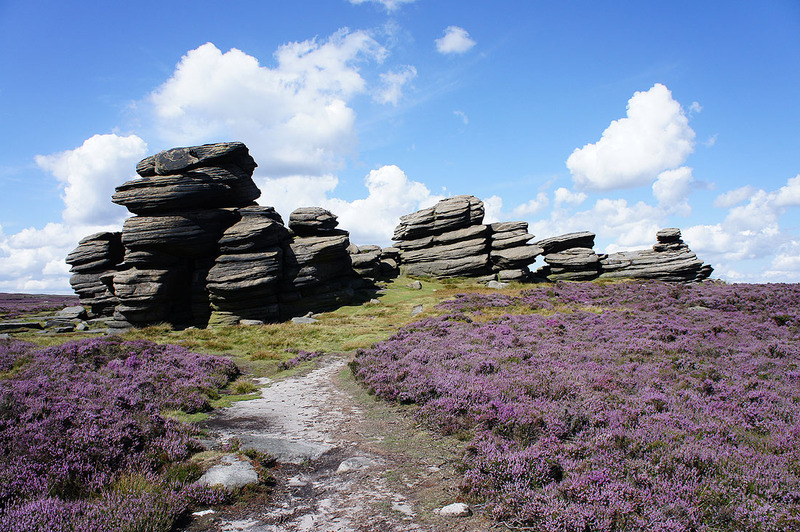 After having my lunch the best bit of the walk lay ahead, Derwent Edge, all the way down to Whinstone Lee Tor. 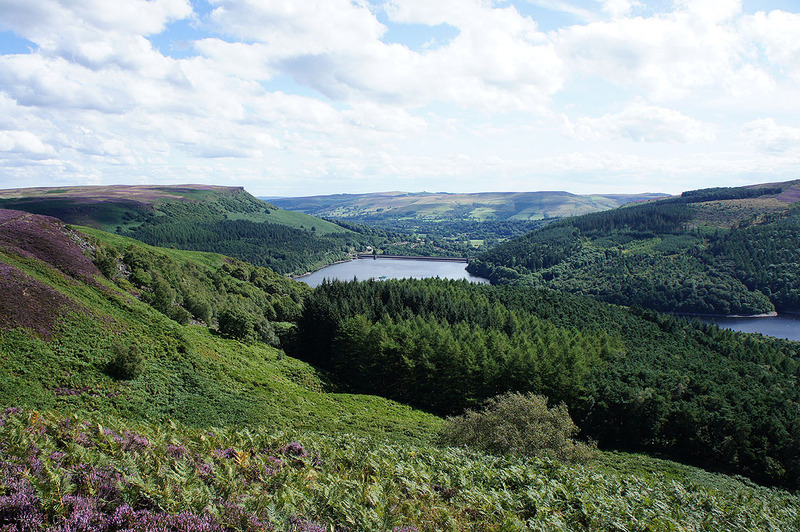 My route back was along a bridleway under Derwent Edge, down Grindle Clough and the road through Derwent back to Fairholmes. 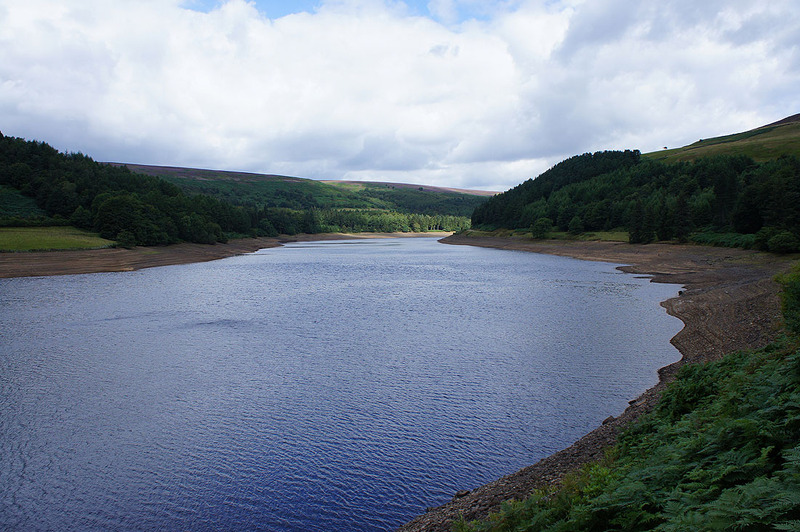 The Derwent Reservoir is less than full at the moment. 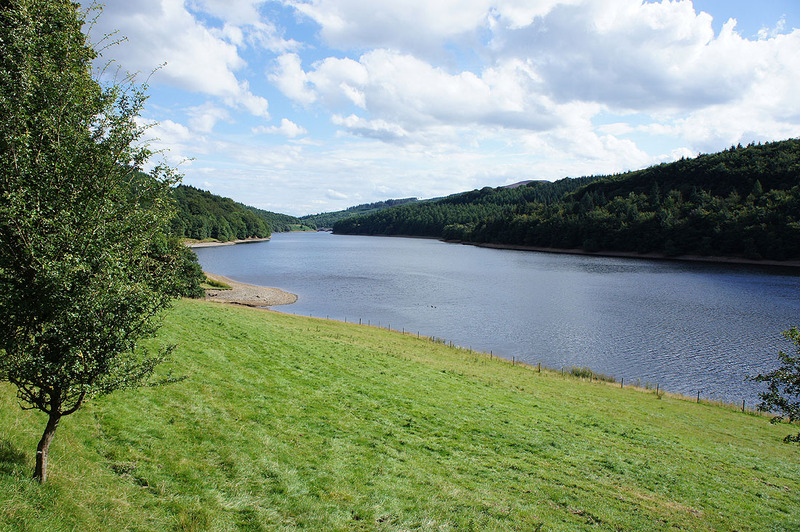 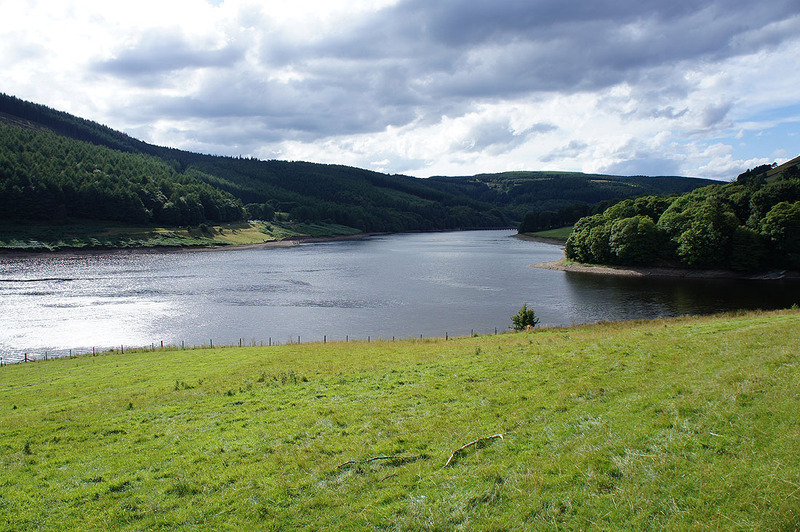 There's a notice board in the car park that tells you how full each of the reservoirs in the Upper Derwent Valley is. 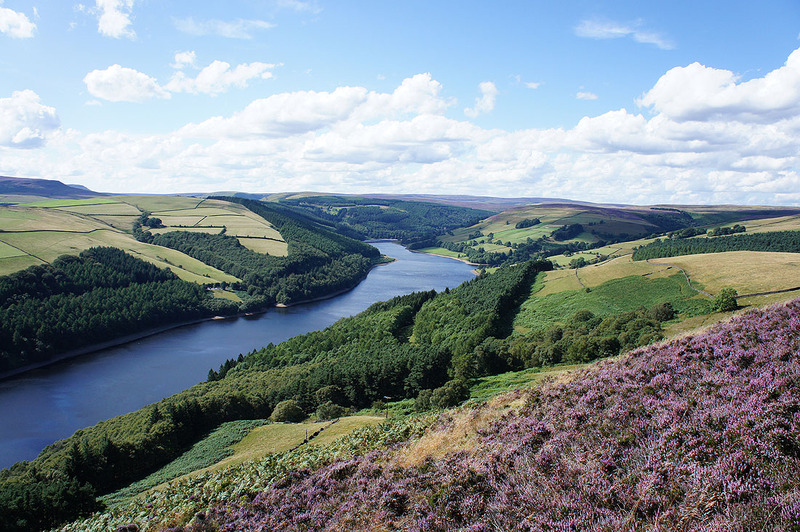 Howden is even lower. 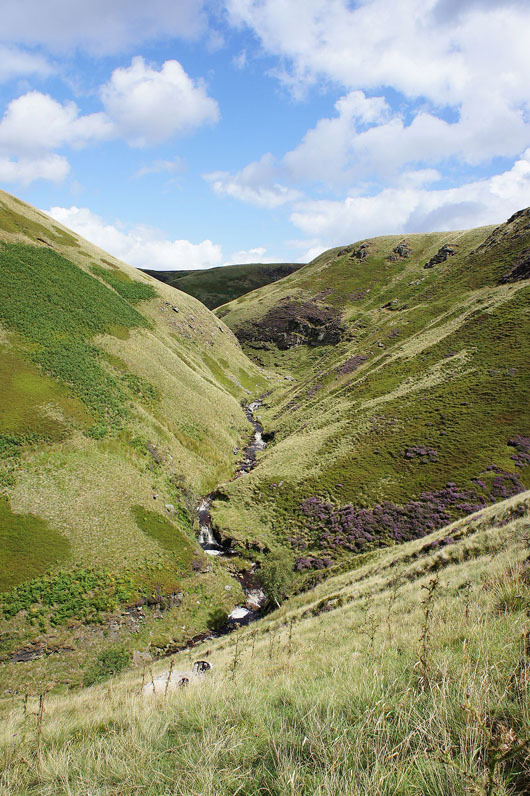 Cascades in Abbey Brook as it turns north. 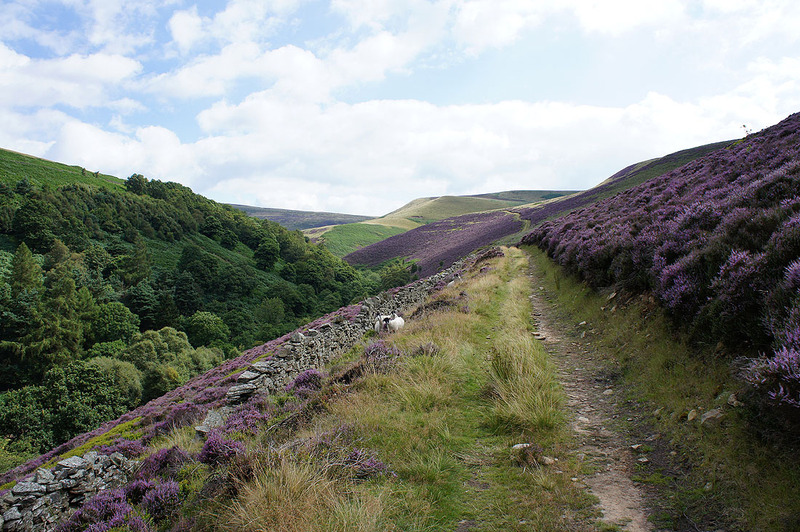 The path I'm on crosses Bents Clough and then crosses the top of the hillside on the right. 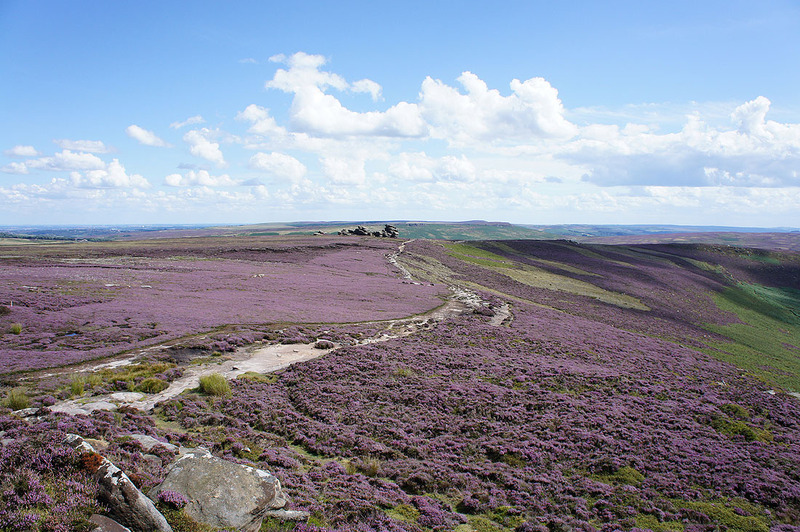 Up on the open moor at last. 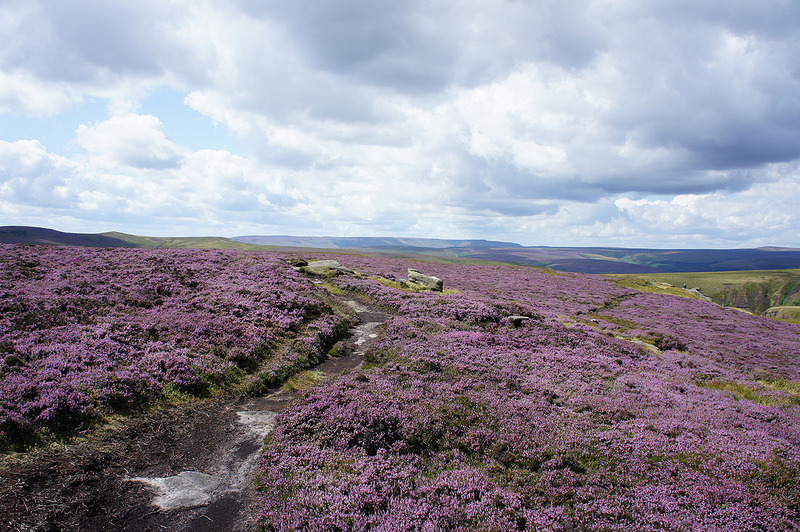 The heather is putting on a fantastic display. 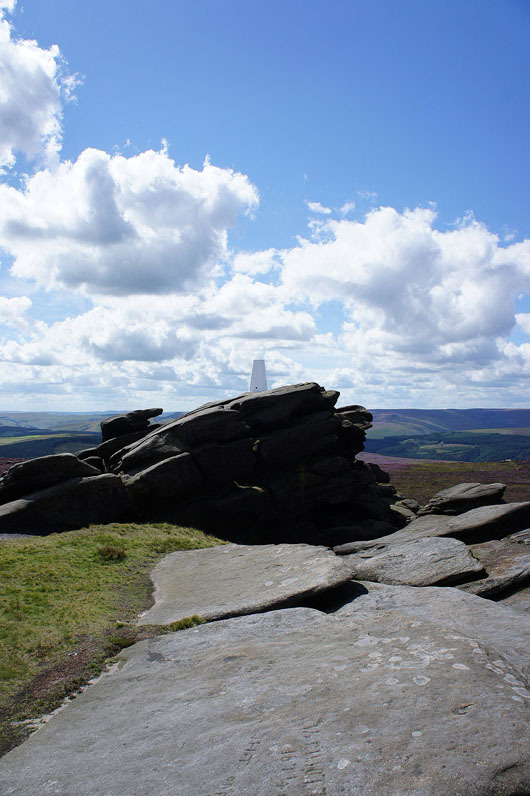 The trig point atop Back Tor that marks the high point of the walk. 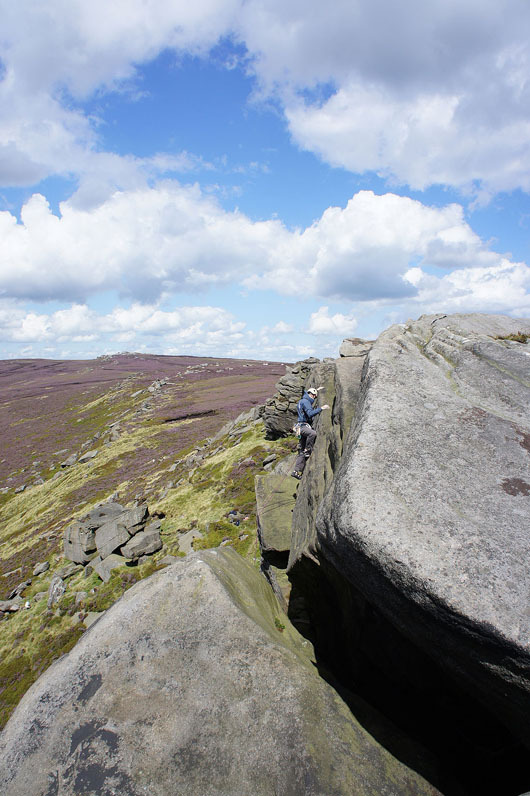 There are easier trigs to reach. 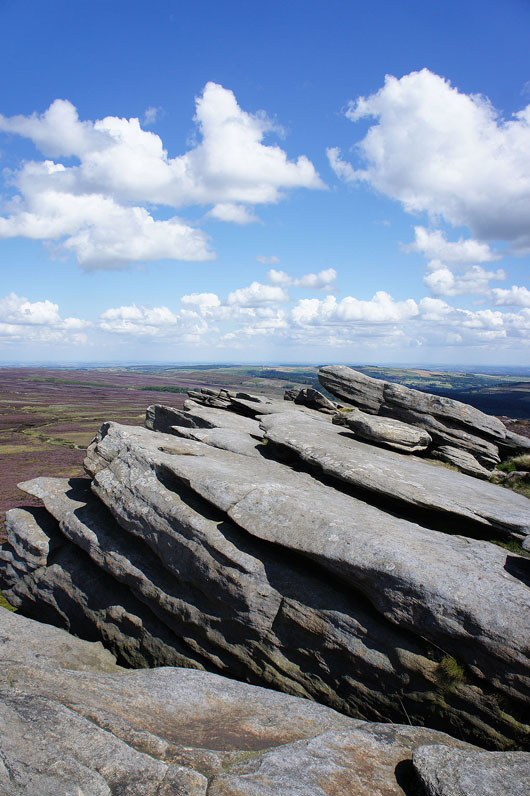 Great views from Back Tor. 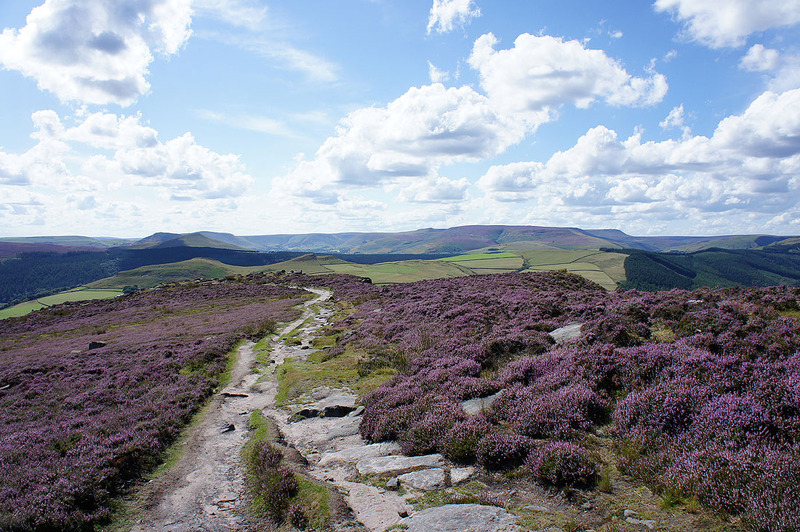 Kinder Scout to the west. 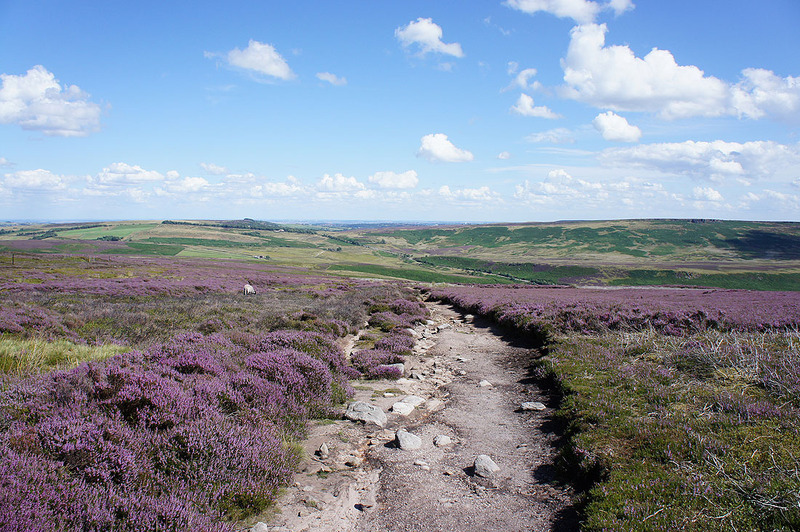 and the Howden Moors to the north. 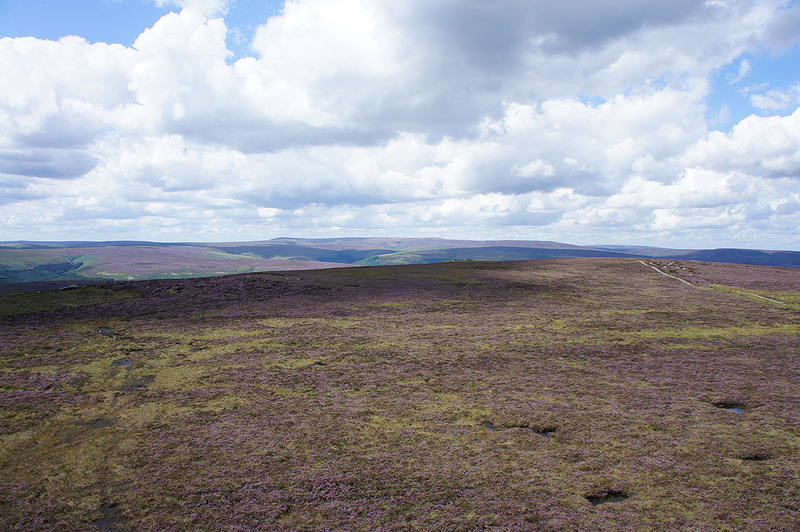 I could make out the TV mast on Holme Moss. 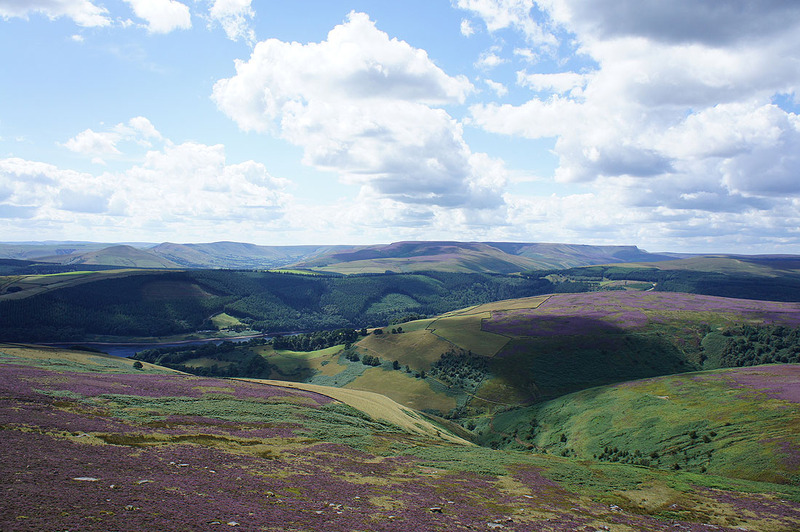 The Great Ridge, the Vale of Edale and Kinder Scout in the distance. 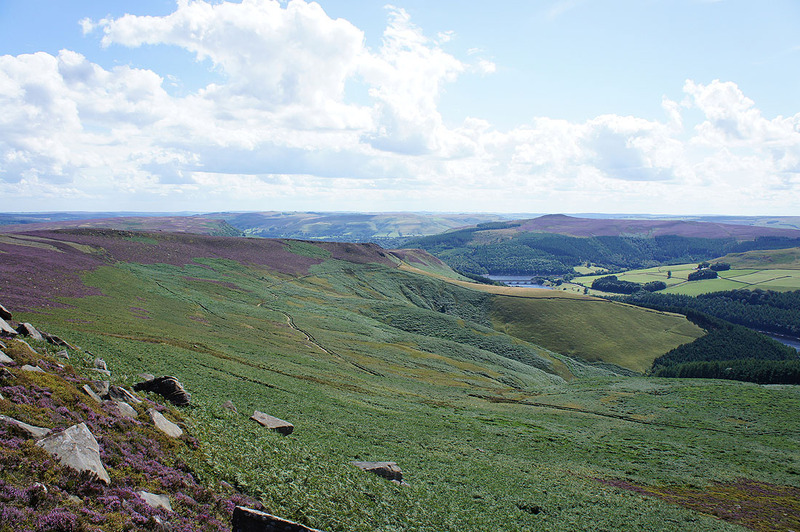 The valley of Dovestone Clough below. 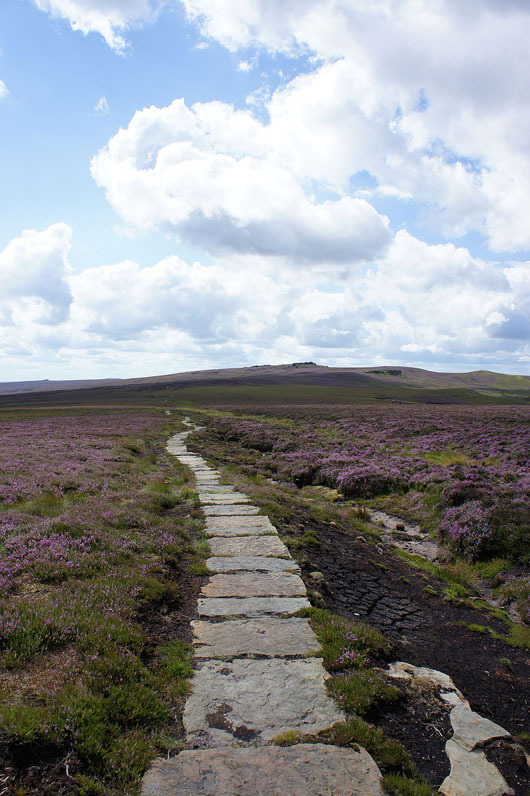 Looking back at Dovestone Tor as I reach the location of..
Bleaklow in the distance from White Tor. 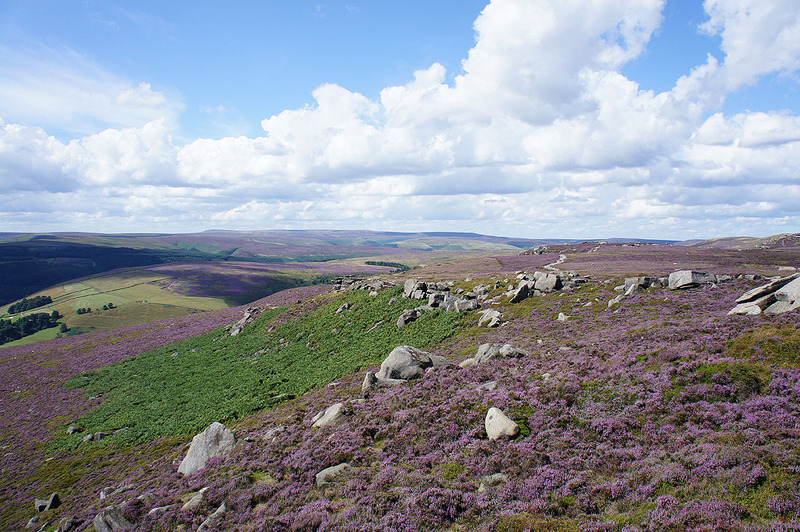 Great colours up on the moors today. 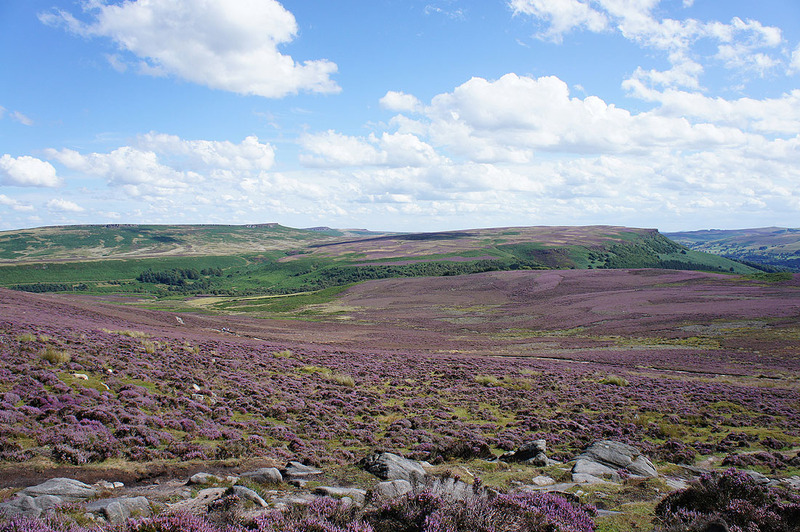 The purple of the heather, the bright green of bracken and blue skies. 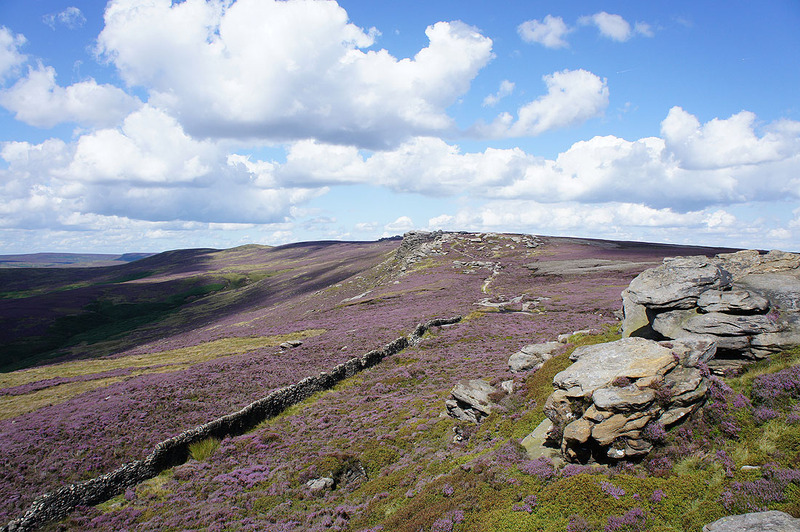 The walk along Derwent Edge comes to an end at Whinstone Lee Tor. 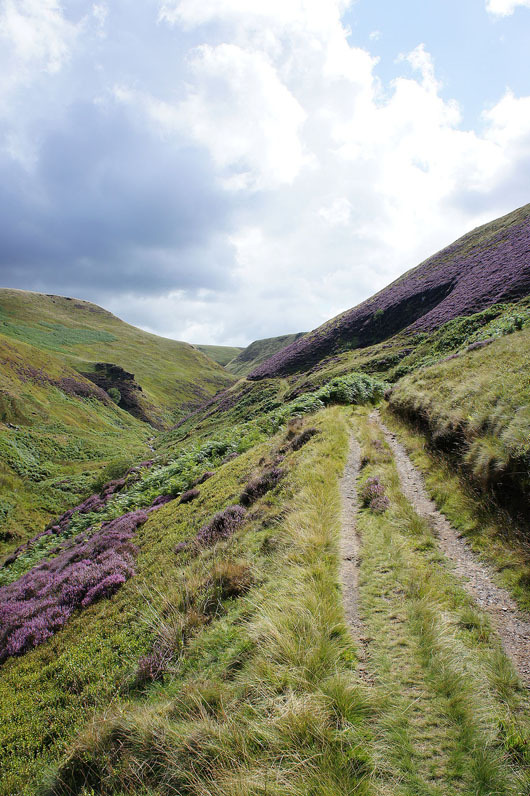 The path back can be seen in the bracken below. 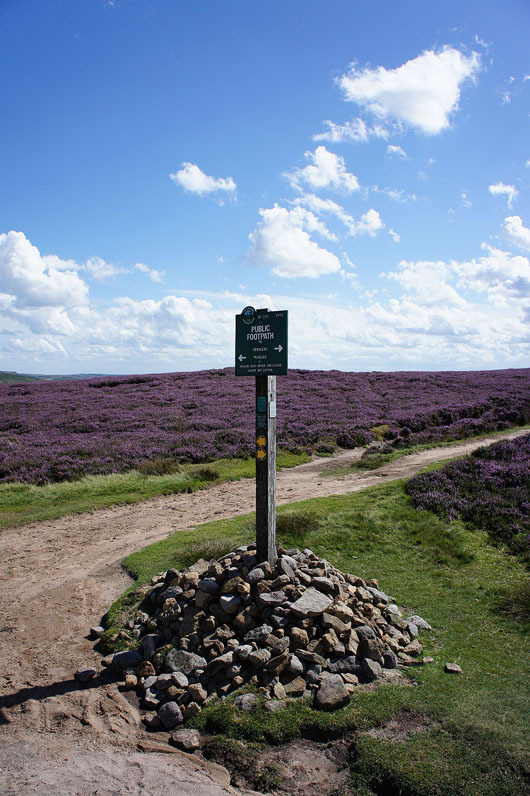 This Peak and Northern Footpaths Society sign marks a crossroads of paths. 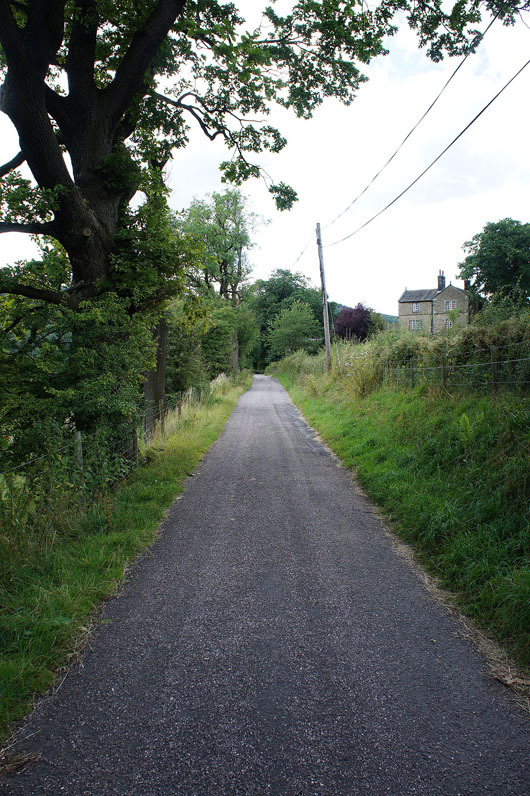 If I wanted to shorten my walk I could turn right here. 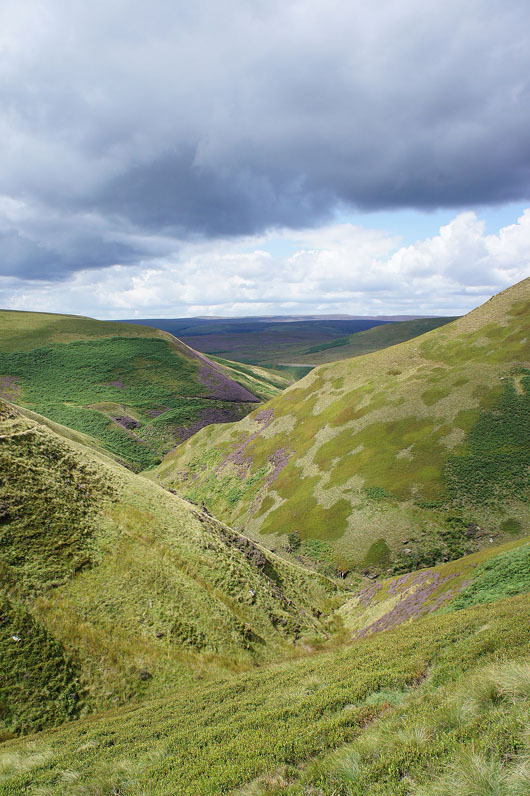 There's a surprsingly good view to be had from here. 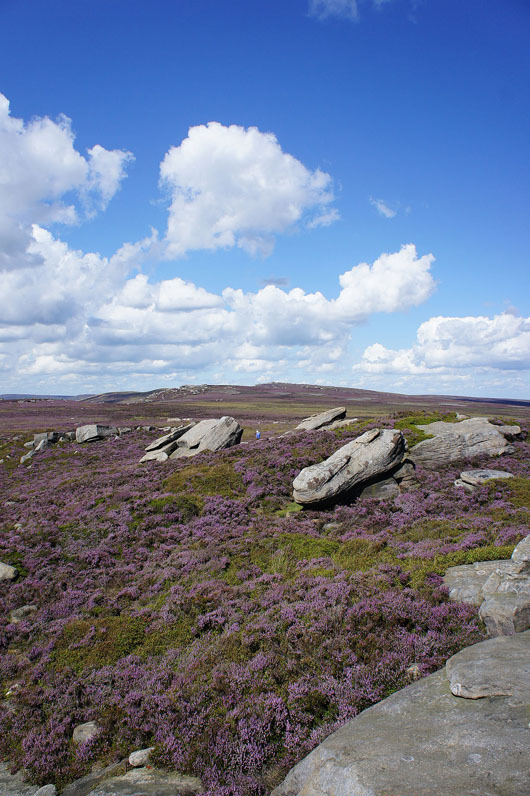 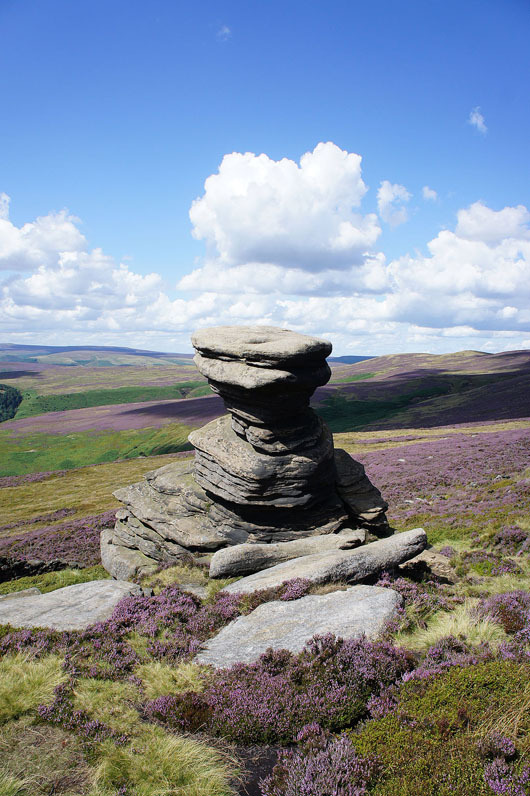 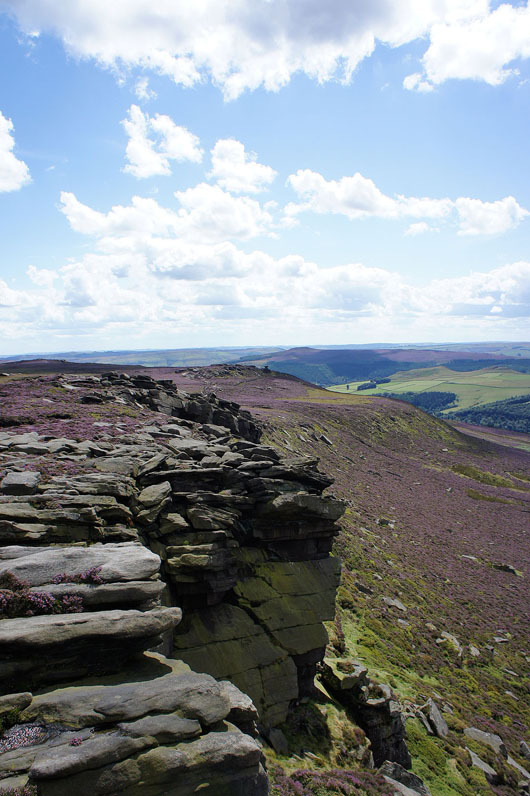 Stanage Edge and Bamford Moor. 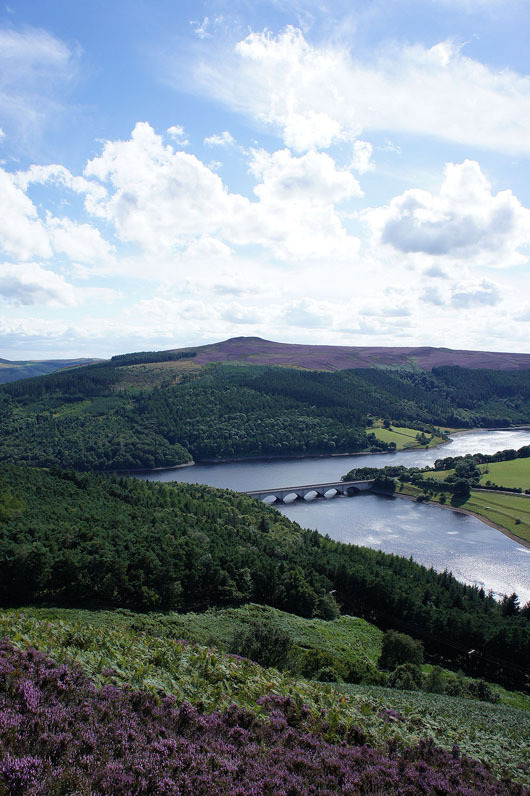 By the banks of the Ladybower Reservoir..